Aerobatics is the most demanding and the most rewarding thing I have ever done. Performing aerobatics well requires pushing both my mind and my body to the limit, and demands that I use my brain in ways it has never been used before. I had always wanted to do aerobatics, since reading about flying as a child. The first time I was in an airplane that did a roll, I loved it! Within a few weeks, I was taking lessons and learning to fling an airplane around the sky. It is one thing to fly aerobatic maneuvers just for fun. Competition brings a whole new dimension, for the quality and precision of the maneuvers are observed and graded by a panel of trained judges. This requires a whole new level of focus and practice to develop skills that will earn good scores. 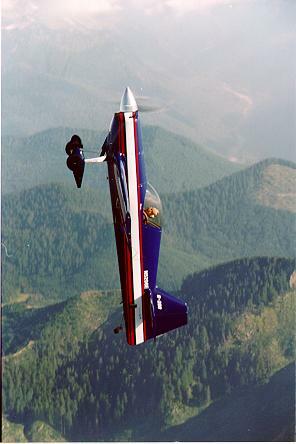 I began competing in aerobatic competitions in 1992, in an airplane I built myself, a RANS S-10 Sakota. The S-10 is a two-seat midwing monoplane. It is fully aerobatic and is capable of 100 mph cruise, with a top speed of about 115 mph. 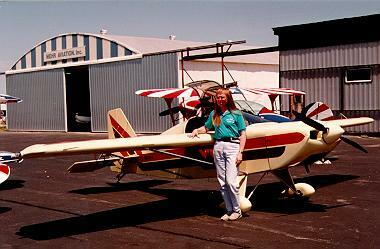 At right, I am standing by my S-10 at my first aerobatic contest, at Orange County, NY, in the fall of 1993. I competed in several International Aerobatics Club (IAC) competitions in my S-10 before it was destroyed in a crash after an engine failure on takeoff. 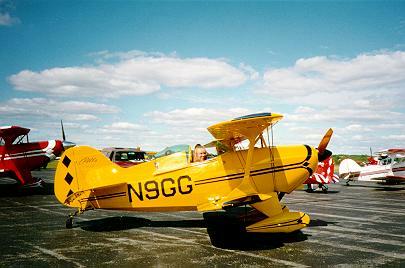 After the crash, I bought another homebuilt aerobatic airplane, a Pitts S-1C, called "Fifinella". Fifinella is a single-seat aerobatic biplane. At left, we are at our first and only contest together, in Poughkeepsie, NY in September, 1995. Unfortunately, I had to sell Fifinella in November, 1996, due to financial constraints, having only flown her for 13 hours. If you are interested in aerobatic competition, please check out the IAC Home Page. If you're from New England, check out the IAC Chapter 97 Home Page. Also, if you would like to see what it is like to fly a competition aerobatic airplane, check out Flight Unlimited from Looking Glass Technologies. There are some excellent reviews of this simulator in the Games Domain. For a non-representative story of what your first aerobatic competition will hopefully not resemble in the least, read about My First Aerobatic Competition (24 kb). For more and bigger photos, see my Photo Gallery.